This is a handsome Tom James vintage mens tie in gold brown blue red squares and flowers. 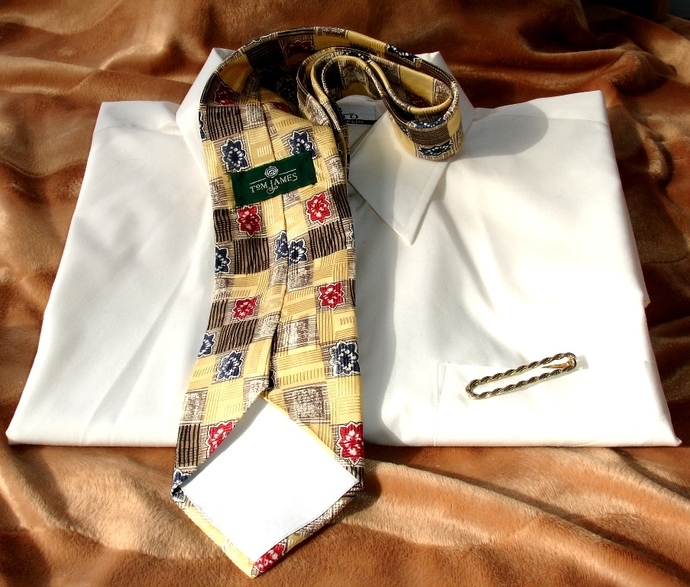 As pictured this tie has yellow gold and brown square patterns in combination with flower squares and striped squares. The overall finish on this tie has an iridescent sheen. Ties build an image of confidence and power and this Tom James vintage mens tie in gold brown blue red squares and flowers motif just epitomizes both of those qualities. 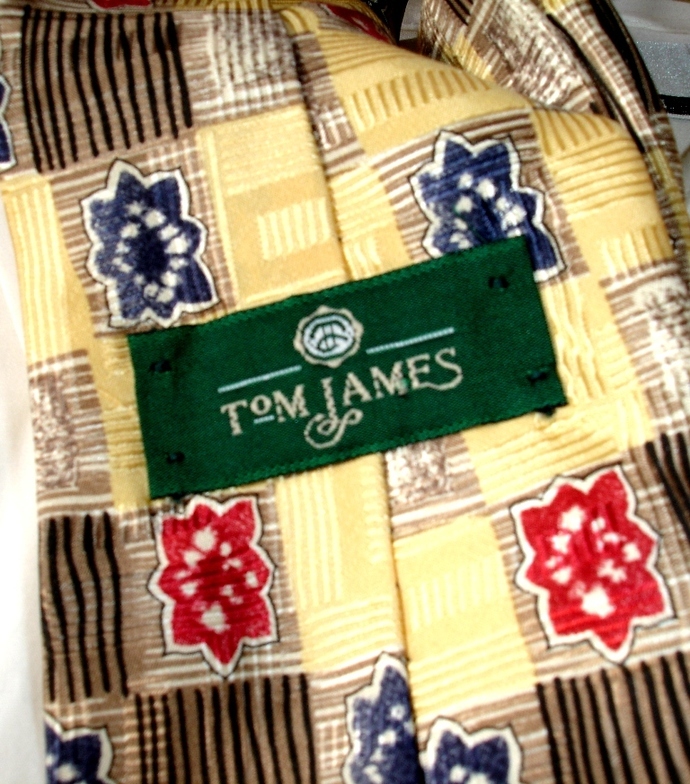 This Tom James Vintage Mens Tie In Gold Brown Blue Red Squares And Flowers motif still has its original tags the large one of course which reads "Tom James", but it also still has its smaller tag which reads "Tall Man". Tie measures approximately 65" in length and 3-3/4" across at its widest point and has no stains, pulls or tears, only some minor wrinkling in the area where the knot would have been made. This great looking tie is in excellent vintage condition and has been well cared for in its lifetime. It originally belonged to a local professional man who was an avid tie collector for years. We acquired much of his collection from his estate. Ties dates range from the 1950's through the 1980's. Listing is for tie only! Shirt and tie clasp are for display only! Tom James Company has been in business for 41 years and is the worlds largest manufacturer and retailer of custom made luxury clothing. Each and every Tom James client purchases directly from one of the company's professional clothiers. Tom James clothiers always come to their clients and the appointments are conducted at the clients location of choice. Tom James offers complete lines of custom made to measure or ready made executive apparel. The wide range of custom choices gives the clients the opportunity to create a personality for their wardrobe. Own a piece of history, buy vintage! 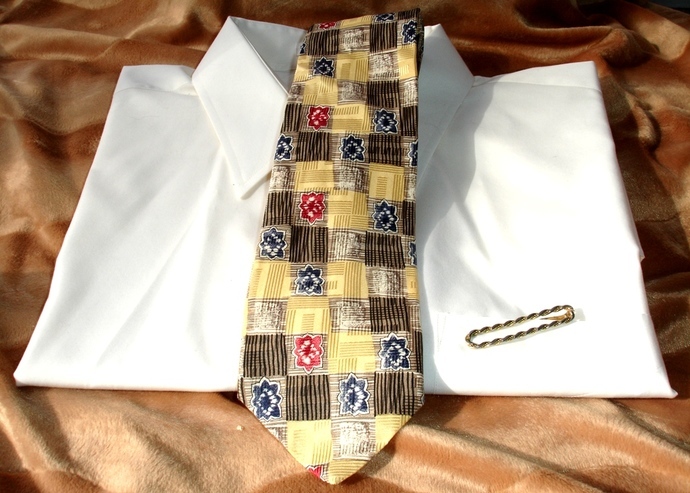 This Tom James Vintage Mens Tie In Gold Brown Blue Red Squares And Flowers motif will ship USPS Priority Mail with Delivery Confirmation in the United States. As of January 1, 2015 we no longer ship overseas due to the change in VAT rules. Thank you. If you have any questions, please send us a message prior to purchase and we will be happy to help you.